I would like to examine the work of Edward Hopper as exemplar in not only presenting and describing architecture, but also in its commentary on architecture, the city and modern society. While Hopper himself denied any deep symbolism in his paintings, we can interpret his work as a mirror to the time in which he lived. His work shows his own personal interpretation and thus representation of the city and architecture, among other things, giving us a vista into his sub- conscience, and thus allowing us to see the world as he sees it and contemplate his perceptive observances of life. We can relate his creation of scenes to that of an architect  Hopper not only paints what he sees but also manipulates the composition to create a space, part imaginary part real  inventing a world for us to be informed as to what already exists, and inspired as to what could be. Hopper has such an expansive repertoire, dealing with a variety of subject matter, but I have chosen a small selection with which I aim to express one dominant issue in each image, to illustrate my own personal interpretation of the work. 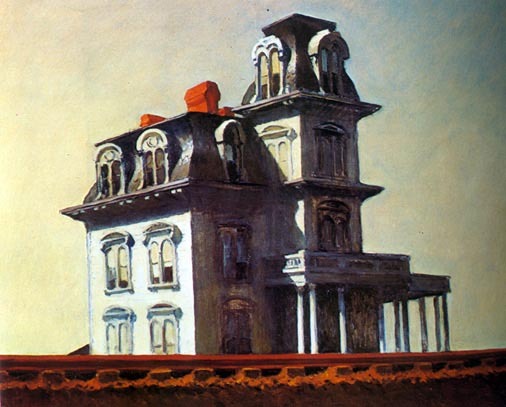 Starting with House by the Railroad (1925), a seminal work for Hopper, where he arrived at his artistic maturity¹ I wish to deal with the topic of an ageing architecture in a modern world. In this picture we see a Victorian style house, standing alone, with a railroad track cutting through the foreground. We see a bare sky behind the house and the complete absence of any secondary objects in the immediate surroundings of the building, allowing us to seriously focus on the articulation of the building and its relationship with its environment. This image can be broken down into two elements: The house, which is the one vertical element, and the uncluttered, linear, horizontal foreground, of the trainline which we can imagine extends far beyond the canvas limits. More than the composition is the mood that Hopper creates by the use of intense light and shadow  a kind of lighting that tells us something about this situation. Were normally light gives knowledge, here the light, creates mystery, that is to say, the dark shadows which exist in reaction to the strong light, dont allow us to see inside the house  thus the light illuminates only the facade  informing us only of the superficial qualities of the facade and leaves us wondering as to what happens within this mysterious interior. The relationship between the interior and exterior is interesting  each expresses a totally different attitude. The exterior is austere, proud (if withered) and aspiration. The interior, on the other hand, with unknown depth created by the shadows, and partially opened blinds, make us imagine that someone, unseen, could be looking out, but have no intention of coming out. A sort of unwillingness to interact with the outside world for all the fast pace (train) and harshness (bright sunlight) that encompass modern living  quite on the contrary to the life this type of building once would have suggested: one of a slower, simpler, perhaps nobler, country life. On contrary to the isolation the American countryside creates by its vast expanses of nature, how the human being can simultaneously feel isolated in the opposite condition: the built up city. While some of his contemporaries tried to glamorise or idealise the monumental structures of the city, Hopper presented them as he saw them, in their elemental, in their everyday existence. And rather than present them as elegant or seductive he presented the city more as a desolate and almost dangerous place. In The City (1927), Hopper shows us a cityscape of a densely occupied part of the city, where the roofscape extends as far as the horizon and the view of this becomes hazy because it is so far away. This feeling of density is further emphasised by the contrast between the long horizontal strip of red, with its many, repetitive windows, which abruptly meets the vertical strip of white which has few windows. Both of these elements give the impression that they extend out beyond the frame. However, we see very little of the hustle and bustle of a busy city. To the left of centre, we see an urban park, what should be a green oasis among dense city, but it is occupied by very few individuals: the only people we can see in this painting at all. Again, as in the previous image, we cannot see inside the buildings. The inhabitants of the city are private: preferring a secluded, compartmentalised existence to the exposed space of the public realm, where all the windows, like eyes, stare out upon the space. This work poses questions about the effect of the physical shape on the city on its inhabitants. The extreme contrasts of proportion between a human and the city scale, makes the human a mere dot in the expanse of the citys facade, which stretch along, not only the horizontal but the vertical axis too. In the attemp to make a complete analysis of the city, in terms of Hoppers representation, we should also look from the perspective of the individual, looking from the interior out into the city. 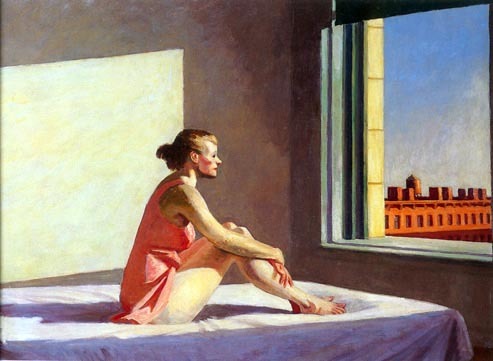 In this painting we see a woman, sitting on a bed, bathed in light, looking out her large window to the city. There is something stark and bare about this scene  free from the trappings of modern life, stripped back to the basic architectural elements, such as the detailed window frame, and the basic necessities such as the bed. The light which pours in, exposes the woman, truly and honestly; we see her skin which is tanned, and the whiter skin which is not often, if ever, exposed to the sun. This same light illuminates the red facade outside. This light, we could say also exposes the honesty of the building. The building which is at odds with the human: it´s stark geometrical contrast with the womans gentle curves and sloping lines. This woman, small in this expansive space, perhaps contemplates her significance in this vast cityscape that she looks out upon. In summary, the work of Hopper goes to inspire the exploration of the themes of architecture and the city. He challenges the ideal of the big city: what are the lives of the individual? And how are they affected by their environment? These commentaries that Ive explored, and interpreted are indeed enforced by my own experience of the city: an experience which, mark how I perceive city life, and how I read representations of it. 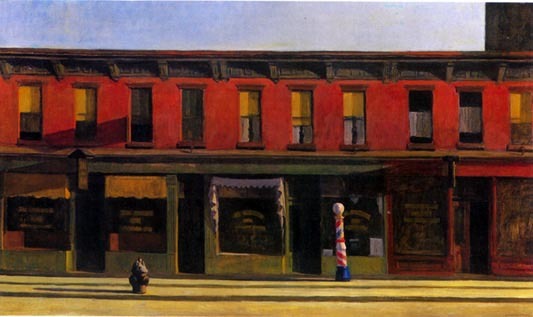 What Hopper presents to us, is a pristine city: free from litter and grime, but simultaneously devoid of the human element. 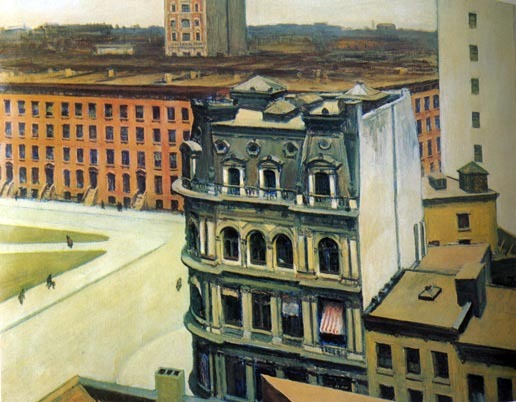 A city, while grand and elegant, like the kind one might imagine an architect to represent when imagining his utopia, but a city in which Hopper imagines the sorrow of the individual, in sincere contemplation and sometimes despair, despite, (or because of?) ones grand and vast surroundings.